One of the earliest printed maps to offer significant detail of the Lower Mississippi Valley. Les Costes Aus Environs de la Riviere de Misisipi. An uncommon map of often neglected and misunderstood significance, this is Nicolas de Fer's 1705 map of the Gulf Coast, Florida, and Texas. This is one of the earliest published maps to show any significant detail of the lower Mississippi Valley. De Fer's map covers the North American coastline from, roughly, Tampico, Mexico eastward along the Gulf of Mexico to include all of Florida and the eastern seaboard as far north as Cape Roman (vicinity of Charleston, SC). It also includes the Bahamas, parts of Cuba, and some of the inland waterways connected to the lower extensions of the Mississippi River. De Fer is illustrating an ephemeral period in the colonization and mapping of North America between the 1688 destruction of La Salle's colony of Fort St. Louis (modern day Inez, Texas) and the consolidation of French power in the region through Jean-Baptiste Le Moyne Sieur de Bienville's 1717 founding of New Orleans. De Fer began drafting this map around 1699 during a period of great political sensitivity. Without a clearly declared heir, the death of Spain monarch, Carlos II, left a power vacuum in both Europe and the New World - one on which the French crown was strategically positioned to capitalize in both arenas. Rene Robert Cavalier, Sieur de La Salle, a French nobleman, explored the lower reaches of the Mississippi from the north, reaching the delta in 1682 (not, as the map's dedication here suggests, 1683). Recognizing the enormous profit potential in controlling the Mississippi River, thus linking French colonies in Canada with the Gulf of Mexico, La Salle returned to Europe to petition the King to build a settlement at the mouth of the river. Permission granted, he returned to the Gulf Coast to found Fort St. Louis. 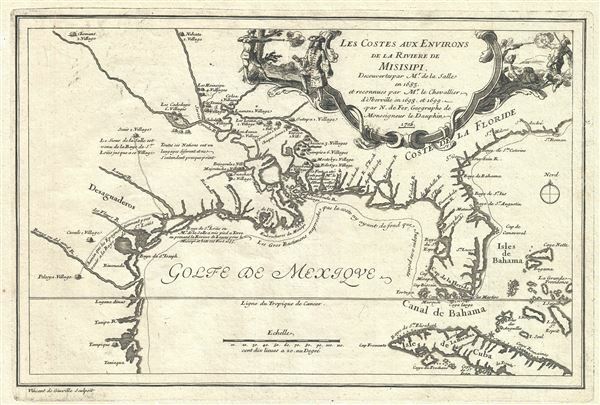 Unfortunately, La Salle was unable to rediscover the mouth of the Mississippi due to difficulties in measuring longitude as well as the inherently confusing nature of that coastline and instead founded his colony far west of its intended location. The fledgling colony though plagued my mismanagement, disease, and hostile American Indians, only antagonized the Spanish further. In response they sent no less than three naval expeditions to map the Gulf Coast - much of the coastal cartography related to which appears here. La Salle himself was murdered in 1687 by his own soldiers, who unhappy with the failings of the colony, mutinied, a topic of considerable interest in Europe and the subject matter of this map's elaborate cartouche. In 1698 the French crown commissioned another explorer, Canadian born Pierre le Moyne d'Iberville, to complete the work La Salle had begun. For the European elite of this period, the New World was more a concept than a reality. While many monarchs had dreams of vast New World empires, few had the resources and manpower to make them a reality. Instead, claims were made based upon 'Right of Discovery' where knowledge of a region was tantamount to political occupation. In the case of the Gulf Coast, Spain had long claimed this territory, but had failed to occupy or properly reconnoiter it - a mistake the French were quick to capitalize on. By exploring inland and establishing clear maps and trade relations with local indigenous groups the French Minister of Naval Affairs, Pontchartrain, recognized he could establish at least nominal control over much of North America. Thus, while this map ostensibly focuses on the explorations and death of La Salle, the cartography is primarily that of D'Iberville, a detailed textually noted in the map's title. The curious choice to emphasize La Salle's assassination and failure in the title cartouche may have been an attempt to draw attention away from the continued French explorations in Louisiana as personified by D'Iberville. The French at this time had every reason to want their Spanish neighbors happy, for Louis XIV's grandson, Philippe, Duc d'Anjou, was the primary claimant to the Spanish Crown. Until he was confirmed as King Felipe V of Spain, French powers needed to tread lightly with regard to any and all colonial rivalries. D'Iberville's accomplishments include mapping some of the inland waterways and tributaries of the Mississippi River as well as making contact and establishing trade relations with various American Indian groups. He founded Fort Biloxi (modern day Mississsippi) and Fort Maurepas (on the Mississippi), both of which are identified here simply as 'Fort.' D'Iberville also founded a fort at Mobile, Alabama, which, though the Mobile River is noted, does not appear on this map, most likely because its 1701 founding postdated the composition of this map. Quite few American Indian villages are named including the Pascoboula, Chicaca, Quimpisa, Moctoby, and Biloky, all of which are on the Pascagoula River. Further west, on the opposite side of the Mississippi River, the combined Bojogoula (Bayogoula) and Majoutacha (Mougoulacha) villages are also noted. As this map as being drawn the Bayogoula were preparing for war against their neighbors. In 1700, they massacred both the Quinipissa and the Mougoulacha, as well as some of the smaller neighboring villages. This conflict was subsequently mediated by D'Iberville's brother, Jean-Baptiste Le Moyne de Bienville, but the damage had already been done. A few years later, and just one year after this map was published, the Bayogoula themselves were massacred by the Tonica (Tunica), another much larger alliance of tribes noted here as residing somewhat further north along the Mississippi. De Fer's work is often criticized for its decorative rather than scientific approach to cartography, especially when compared to the academic work of fellow 'Geograph de Roi' Guillaume de L'Isle. Nonetheless, he does introduce some new ideas and as the Dauphin's personal cartographer De Fer had access to some of the most up to date cartographic information. This map is unique in that many of De Fer's actual manuscript originals and sample maps have survived, thus to some extent we are able to postulate on his though process and study his sources. De Fer based this map on the 1698 map of the Gulf of Mexico by La Salle, a 1700 Map of the Gulf coast by Spanish navigator Juan Bisente, and an even earliler map also by Bisente dating to 1696. These he updated with data from D'Iberville's expeditions. The result is one of the earliest published maps to offer any real detail of the Lower Mississippi Valley. One very interesting departure from a convention being established in several previous late 18th century maps is De Fer's rejection of the 'Florida as Archipelago' hypothesis. Here Florida takes on a clear if distorted peninsular form that would also be embraced by De L'Isle later in the same year, 1701. This map was drawn by De Fer between 1699 and 1701. It was engraved by Vincent de Ginville in 1701. We are aware of two states, 1701 and 1705. With the exception of the date, which has been updated for the 1705 edition, we have been able to identify no cartographic changes. De Fer published this in his L'Atlas Curieux ou Le Monde. Very good. Clean crisp impression. Original platemark visible. Blank on verso. Jackson, J., Flags Along the Coast : Charting the Gulf of Mexico, 1519-1759: a Reappraisal, page 36-38, plates 11, 12, 13. Martin, J. and R., Maps of Texas and the Southwest, 1513-1900, pages 90-91, plate 13. OCLC 494647318. Lemmon, Alfred E., Magill, J., and Wiese, J., Charting Louisiana; five hundred years of maps, no. 12. Goss, J., The Mapping of North America: Thre Centuries of Map-Making 1500-1860, no. 48. Day, J., Maps of Texas 1527-1900: the map collection of the Texas State Archives, no. 1458.